^ motorcycle (vehicle). Encyclopedia Britannica. 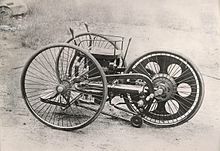 ^ The Past – 1800s: First motorcycle. The History and Future of Motorcycles and motorcycling – From 1885 to the Future, Total Motorcycle Website. [2015年11月7日]. ^ Lienhard, John H. Inventing Modern: Growing Up with X-Rays, Skyscrapers, and Tailfins. Oxford University Press US. 2005: 120–121. ISBN 0-19-518951-5. ^ Setright, L.J.K. The Guinness book of motorcycling facts and feats. Guinness Superlatives. 1979: 8–18. ISBN 978-0-85112-200-7. ^ Falco, Charles M.; Guggenheim Museum Staff. 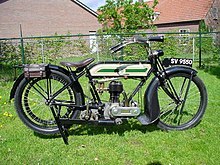 Issues in the Evolution of the Motorcycle. (编) Krens, Thomas; Drutt, Matthew. The Art of the Motorcycle. Harry N. Abrams. 1998: 24–31. ISBN 0-89207-207-5. ^ Brief History of the Marque: Hildebrand & Wolfmuller. Hildebrand & Wolfmuller Motorad, European Motorcycle Universe. [2015年11月7日]. ^ Walker, Mick. Motorcycle: Evolution, Design, Passion. JHU Press. 2006. ISBN 978-0-8018-8530-3. ^ George Hendee. The AMA Motorcycle Hall of Fame Museum. [2015年11月7日]. ^ Youngblood, Ed. The Rise and Fall. American Motorcyclist 55 (6) (American Motorcyclist Assoc). June 2001. ^ Triumph history. [2015年11月7日]. （原始内容存档于8 September 2008）. ^ History of Harley-Davidson Motor Company. ^ Prashad, Sharda. HOG WILD; U of T professor Brendan Calder is one of the legions of baby boomers who have helped to ensure the success of the Harley-Davidson brand name, not to mention its bottom line.. Toronto Star (Toronto, Ont.). 16 April 2006: A.16. ^ Cato, Jeremy. 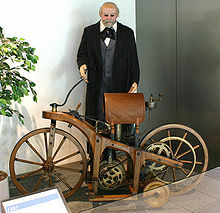 Harley-Davidson at 100. The Vancouver Sun (Vancouver, B.C.). 8 August 2003: E.1.Fro. ^ Vance, Bill. Motoring Memories: DKW/Auto Union, 1928–1966. Canadian Driver. 24 April 2009. ^ de Cet, Mirco. The illustrated directory of motorcycles. MotorBooks/MBI Publishing Company. 2002: 128. ISBN 978-0-7603-1417-3. ^ Walker, Mick. Mick Walker's German Racing Motorcycles. Redline Books. 1999: 61. ISBN 978-0-9531311-2-9. ^ Willoughby, Vic. Exotic Motorcycles. London: Osprey Publishing, Ltd. 1982. ISBN 0-85045-322-4. ^ Rupert Hollaus. Motorsport Memorial. [2015年11月7日]. ^ Ed Youngblood. Motocross goes International, 1947 through 1965. The History of Motocross, Part Two, Motorcycle Hall of Fame Museum. [2015年11月7日]. （原始内容存档于2007年11月13日）. ^ 广东省公安厅交通警察支队. 《广东机动车驾驶员考试教材》. 广东教育出版社. 1996. ISBN 7540632143. ^ McCraw, Jim. Motorcycle Wars: Japan's Latest Shots at Fortress Harley. 纽约时报. 1997年7月20日 [2015年11月14日]. ^ 翁聿煌. 〈台北都會〉福樂公寓窄道 早不合時宜. 《自由時報》. 2010-11-12 [2016-11-02] （中文（台灣）‎）.